The Kia Stinger range is priced from £31,995 to £40,495 in the UK, as the brand prepares its sales launch in this country. The Stinger’s entry-level engine is a 244bhp 2.0-litre turbocharged petrol unit. However, the Audi A4 and BMW 3 Series’ entry-level models have 1.4-litre units, making the Stinger more of a lower-price rival to the higher-spec 2.0-litre petrol Audi A4 and BMW 330i models, which start at £33,790 and £34,730 respectively. This pushes the Stinger's entry point well above rivals such as the Audi A4, BMW 3 Series and Mercedes-Benz C-Class, which start at a respective £27,260, £26,790 and £29,035. Topping the range is the Stinger GT-S, which has a 3.3-litre turbocharged V6, producing 365bhp and 376lb ft. This variant starts from £40,495; undercutting the Audi S4 and Mercedes-AMG C43 by around £5000 but topping the BMW 340i by £235. Mid-range cars are expected to be the best-sellers, with a bias towards diesel engines. Overall, there will likely be a 60/40 split in favour of diesels. Sales begin on 1 January 2018, with deliveries beginning at this date too, and monthly prices are to be revealed nearer the on-sale date. Kia plans to sell around 1800 in the car's first year. Europe's entry engine is a turbocharged 2.2-litre four-cylinder diesel that produces 197bhp and 325lb ft of torque - the latter figure is available from 1750-2750 rpm. It can accelerate the car to 62mph in 8.5sec and onto a top speed of 158mph. Above this sits the first petrol engine, a turbocharged 2.0-litre four-cylinder that produces 252bhp and 260lb ft of torque. No straight-line performance figures have been released for this unit yet, but it's expected to be slightly quicker than the diesel. Top of the range is the turbocharged 3.3-litre V6 petrol engine of the Stinger GT. The GT is aimed squarely at more potent versions of the Stinger's rivals, although it sits below the likes of the BMW M3 and Mercedes-AMG C63. Its engine produces 370bhp and 376lb ft of torque and can accelerate the car from 0-62mph in 5.1sec, meaning the GT can outpunch the 349bhp Audi S4. Kia targets a top speed of 168mph for the GT. Both rear and four-wheel-drive versions of the Stinger are available, and the car has an eight-speed automatic gearbox as standard. At 4831mm in length, the Stinger is almost 200mm longer than a 3 Series and actually closer to the BMW 5 Series (4935mm). It is 1869mm wide and 1400mm tall and has a wheelbase of 2906mm. This makes it 58mm wider than a 3 Series and 41mm lower, with a wheelbase that’s 96mm longer. The Stinger has been honed at the Nürburgring under the watch of Albert Biermann, who was poached from BMW’s M division in late 2014. In fact, the BMW 440i has been used as a benchmark. It is closely related to the GT concept of 2011 — a car that Kia says it never lost sight of in the intervening years and always intended to use as inspiration for a production car. Underpinning the Stinger is a modified Genesis chassis, 55% of which is made from lightweight high-strength steel for what Kia claims is a rigid chassis with reduced levels of noise, vibration and harshness in the “quiet cabin”. The suspension features MacPherson struts at the front and a multi-link system at the rear, and is claimed to have been tuned “to provide optimal feedback to the driver”. The suspension is adjustable with adaptive damping, a Kia first, through a system called Dynamic Stability Damping Control. Kia has tuned the system to offer agility through the corners as well as high-speed stability. For the first time, Kia will offer switchable driving modes, with five settings on offer. These modes adjust not only the firmness of the suspension but also the responses of the variable-ratio electric steering, which has the motor mounted directly on the steering rack for what Kia claims are improved responses and feedback and reduced vibrations. The four-cylinder Stinger has 18in alloy wheels and 225/45 R18 ‘performance’ tyres, with 19in alloys and 225/40 R19 ‘ultra-high-performance’ rubber for the GT model. Brembo brakes with four-piston calipers at the front and two-piston calipers at the rear provide the stopping power for the GT model. Pricing for the V6 Stinger GT has not yet been confirmed, but it is expected to be in line with that of a top-spec Sorento, which costs £49,050. Speaking to Autocar in Detroit, Biermann described the car as an excellent all-round gran turismo car rather than an out-and-out track car. "It's a really sporty car but still a good all-rounder. It has a high handling level but is still comfortable and has a spacious interior." Stability was also a key part of the GT's appeal, he added, and the confidence it inspired when you pushed it. Biermann said that he hoped the Stinger GT would have an impact on the handling of the rest of the Kia range. "We're on the way to do that; we already have some good-handling cars and are on the way to doing more." Biermann said the GT had been one of the key reasons he switched to Kia from BMW. "There's this car and a few others. I thought: 'Wow, what an interesting challenge.' I wanted to get them dancing, complete and fun to drive. It was still a concept when I joined, but I guided it. Such a car you never leave alone, you babysit it." What can this do for the Kia brand? "It's a milestone, a strong statement. I think it's a brand shaper. This is a special moment. We're a challenger brand but we have a strong design philosophy. The brand and design already have consistency. This car makes the brand more sporty, more fresh, younger. It shows in that we can compete at a high level with some of the premium brands." Can it really challenge premium brands? "The premium brands have a loyal following, but in the US market this is not such a problem. We have a great chance US, which is key for the car." Did you try and stick closely to the GT concept? "We had a concept car that got so much positive feedback from media, dealers and customers that we went into looking at it for production and the business case. It got more and more serious. I still remember when we first knew about making it; it was good news for all of us and we had time to really refine the design. Put it next to the concept and you can see it's really close, and in some ways it's even better." Was it nice to design a rear-wheel-drive car? "It was a dream to get these kind of proportions, which are possible only with a rear-wheel-drive platform. It's the beginning of a new chapter for Kia; I never want to see an end and we will never be done. We will always go on and open up the doors. This allows us in other segments to make more attractive and sporty architectures and proportions." Was it design or engineering led? "It's a design lead project definitely but we can't do it without engineers. We work together with engineering and Albert Biermann. He was so excited when he first came here and has been a big help." Looks like an extremely stylish and capable grand tourer from Kia. Good to see that they have also managed to retain many of the design elements from their 2011 GT concept car. 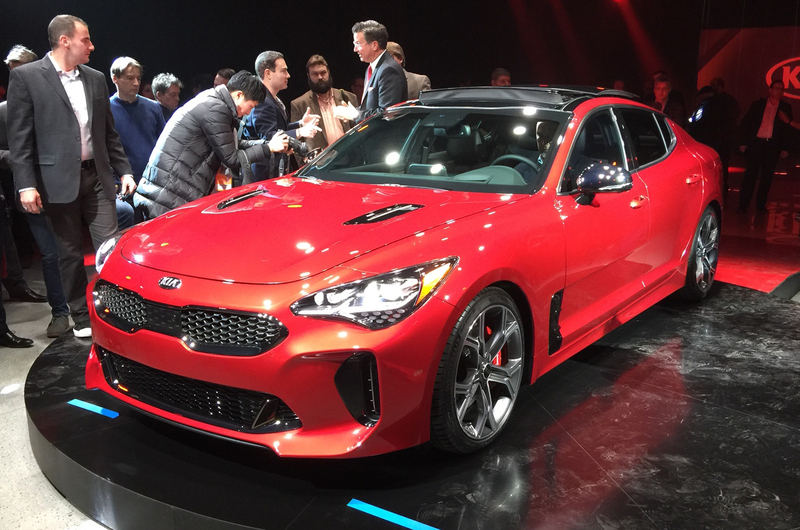 KIA Stinger GT stings the continental competition! This is how I see KIA's first performance sedan potential upending the western car makers. This is not a mundane KIA of years gone by, this is a game-shifting car akin in the mould of the NSX to challenge the established automotive order. That car looks distinctly odd, with different areas looking like they've been 'inspired' by BMW, JLR, Chrysler/Dodge, Chevrolet, Holden, Ford, Audi, Porsche and probably a few others. But then that wouldn't come as a huge surprise to anyone who's stood on a Seoul street corner and noticed the design approach of domestic market vehicles. Looks decent and applaud the ambition from Kia. I think they took inspiration for the name from Grand Theft Auto as well as the 1970s. Maybe they could do a coupe inspired by the Jenson Interceptor next. Looks great but will it sell well? The Stinger is actually a XF/5 Series/A6/E Class rival and is Kia's sister car to the Genesis G80 (previously Hyundai Genesis). Either way, while some of of the minor external trim looks a bit OTT and garish but overall the Stinger looks infinitely better looking and more desirable than any 5 Series, A6 or E Class while in profile there are hints of Jaguar. The only thing is whether buyers can look past the badge of the Kia, whether the car is actually any good or not and is priced attractively. After all, the Cee'd and Optima aren't exactly flying out of showrooms in the UK at least. The Stinger is actually a XF/5 Series/A6/E Class rival....... After all, the Cee'd and Optima aren't exactly flying out of showrooms in the UK at least. Non is the unloved XF! Was it their intent to rival an S4 or is this just editorial license given the similarity in form and technical stats..? either way why not have ambitions to rival a true drivers car?